A while back I did some research on wicks and what I read about HTP wicks made them sound like the perfect wick, and it might all be true except for one little problem they forgot to mention. They don’t smoke, mushroom and they are self-trimming. The problem is they curl, which means the bend over at a 90 degree angle, see picture. That would be fine except it moves the heat from the wick to one side, causing the MP to be off center, see picture. It is very frustrating. If I knew which way they were going to bend I could compensate by putting them off center. The best Idea I’ve come up with is to burn the wick a little to see which way it curls before attaching it to the container. That drives me crazy too. I love HTPs, but the lean is aggravating. One thing that helps is to trim your wick shorter for the first couple burns. Yours looks a teensy bit long, if you trim it just a bit more it won't lean over quite so far. Another thing that helps is dipping your wick in the opposite direction of the lean when you put it out. That can help correct it a bit. Other than that, it looks sloppy for the first few burns, but once you get closer to a full MP it isn't so bad! Just watch it toward the bottom of the jar, if any soot is going to happen, it will collect on the lean side of the jar. Oops, I see that's a tin. ☺️ You may avoid the soot issue altogether then! I’ve read that they bend toward the “V” side of the braid. Cd and eco have curled over onto themselves in some of my waxes. It ruins the burn in several ways, so I finally moved away from them. I can see the V, so clearly I need to make a test candle today:) I'm burning a test candle right now in an 8oz tin with an HTP that is clearly overwicked; the MP is touching the tin on one side and a full inch away from the other. If the wick was 1/2 inch over it would be centered. I can't remember if I've ever tried it with HTP wicks, but try twisting them before inserting into the jar. This will force them to burn on both sides! I do it with flat style wicks. It looks to me like they bend away from the V, but that may be my way of interpreting it. There is a V on both sides, but one is upside down. I'm burning two candles that I had wicked down to an HTP 93 from a zinc 51 and both are burning beautifully; the MP is only slightly off center. I had to stop testing a candle that was overwicked wit an HTP. I get the feeling that perhaps having the right size wick is more important than the type. That is very interesting, I'll certainly try it. I wonder if it will inhibit the HTPs self-trimming quality. It has never affected any of the self trimming wicks I've used. 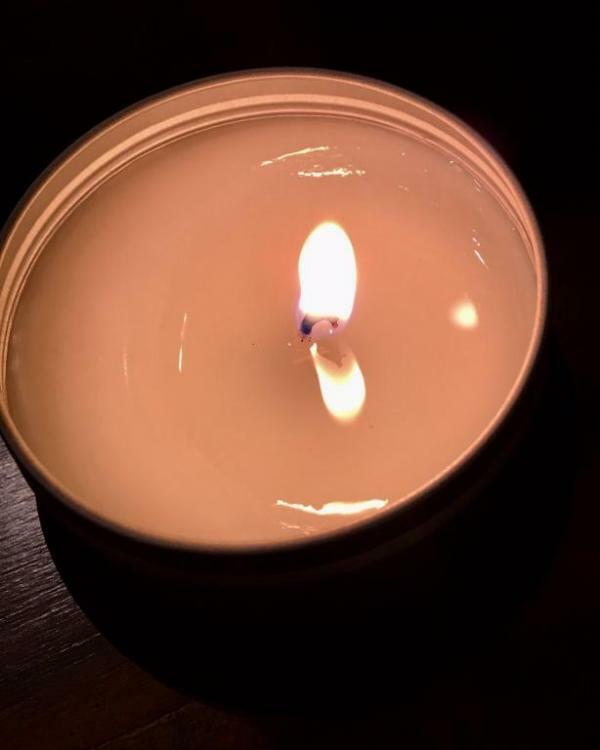 All you're doing by twisting is forcing it to burn all the way around the candle, it really works great on those flat buggers that want to lean one way. I have only had occasional and inconsistent luck by twisting them. Sometimes it helps a bit, but for me it usually does not. Bare in mind that it takes a while for the unwinding to occur because they burn at a slow rate. Its only going to start curling back another direction only after plenty of was has been consumed... several hours. By that time, the wick has already started leaning to one side, especially with the added weight of the wax being pulled up and then also the curl. By the time it does finally start to change directions, its usually already leaning too much to have the ability to lean back to proper posture, let alone the other direction. I have really only had luck in very light easy to work with and quick burning FOs. But, with those... I typically do not have much of an issue in the first place. Who carries the best selection of HTPs? I can only find one or two at one or two places. Interested in testing the full range. Thanks. HTPs are very common, you should be able to find the full range with several suupliers. I just tried these for my custom blend. Only wicks that give me a good burn. Have not had too much trouble with the curly issue, and they burn hotter than ecos in my blend - tho I do like those eco wicks. Candlewic does not have the lower 52 and 62.
https://www.candlemakingsupplies.net/ also has HTP wicks. im currently testing HTP wicks with C3 wax. would you consider this as too big of a wick? Yes it is. Probably 3 sizes if I had to make my best guess. But would depend on how long its been burning to be more precise. Definitely over-wicked. Big melt pool (not sure how long that was burning), long stalk, and carbon mushrooms. Took me a while to see this pattern, but when I light a tester for the first time and there's a big flame height and smoke curls, I know it's not a good wick match. I'll give it a few minutes MAX to stabilize but if it doesn't, I stop burning and re-wick.